I got an e-mail recently showing off the promo of the new Sugarpill Cosmetics Cold Chemistry Palette, I'm pretty darn excited for a new palette so figured I would post the picture. An alchemic collaboration between Sugarpill and Amelia Arsenic, makeup artist and designer of cult fashion label A is for Arsenic. 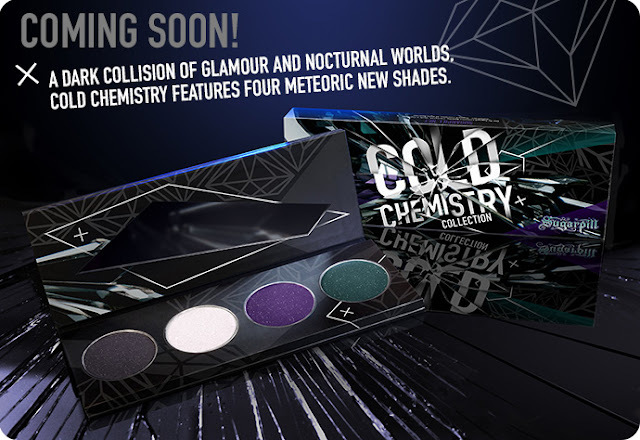 "After previewing the collection at IMATS last June, Cold Chemistry has become our most highly anticipated release yet. This baby's in production and will be here before you know it!" I'm especially excited to get my hands on the two colors on the right! Now just to talk the husband into letting me spend more when it comes out lol. Are you excited for this palette? Planning on picking it up?